T’ai Chi Ch’uan, pronounced “tai jee chwan,” translates as “supreme ultimate fist art.” That is, a martial art based on the Tao (supreme ultimate) or the way of harmony. 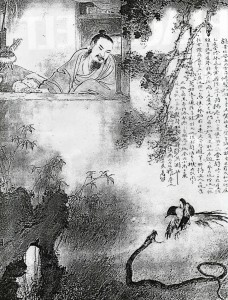 The beginnings of T’ai Chi are shrouded in mystery, but in the 13th century a monk named Chang San Feng, after witnessing a fight between a snake and a bird, is said to have combined ancient Taoist medical theory and Qigong (breath and energy excersises) with Wudang and Shaolin martial arts to create a new, “soft” or “internal” martial art that uses relaxation and slow movement to cultivate the Chi (internal energy or life force) while training the body to a high level of health. Once practiced in secret and passed down as family treasures, these arts are now used daily by millions of people world wide. The slow, relaxed exercises are low impact, easy to learn and have immediate beneficial effects on the practitioner. Continued practice improves balance, alertness, flexibility, dexterity, weight control, mental attitude and overall health. When practicing T’ai Chi Ch’uan, one’s mind and muscles must be relaxed and flexible. Moving through the form while relaxed stimulates the body to heal, strengthen and improve itself at any age. The exercises are easy to learn, but challenging to all who practice them. They function on physical, mental and spiritual levels, providing the student with a life long process of growth and discovery. T’ai Chi and Qigong are used to help people suffering from a wide variety of illnesses and injury related problems. These arts are also widely used to slow down the advancement of symptoms associated with several degenerative diseases. The most widely reported effect by those who practice is a general feeling of health and well being.